Comments for Giveaway are Closed. There is a blogger issue that will not allow me to stop comments, but the last comment prior to Midnight November 14th is the last one that will be counted. The winner is Kathy E.
I hope you saw Kelly's post yesterday at I Have a Notion. Today is my day. For the design I chose to use the Feathered Star Design. It is a great design that would look great on a quilt. But I chose to do something else with it. I did several sew-outs before I started a project just so see how the design works. So those will probably show up in a quilt later. I love this design; it is so versatile. One thing that I enjoy doing is playing with the colors of thread. But I also love to see what else I can do with the design. Since this design comes in three sizes, 3.75", 5" and 7" I decided to use the two smaller sizes and do more than one of the design on a project. My first project was a red pillow. I first set the 5" star in the center of my design field. Then I added two of the 3.75" designs and moved them around on the design screen until I liked the arrangement. I added a bit of batting behind the fabric to add dimension. It is not very obvious in the photo, though. As you can see, I did quilt the pillow cover before I fully assembled the pillow. My next project was another pillow, using a white fabric that I had bought previously in the upholstery section of the fabric store. It has a lovely texture and shine in person. I think that I may need to rip out my hand stitches and add a bit more fiberfill into the pillow so it puffs out more. I clearly need lessons in stuffing a pillow properly. You may notice that this design looks very different. I told you that I like to see what else I can do with a design. 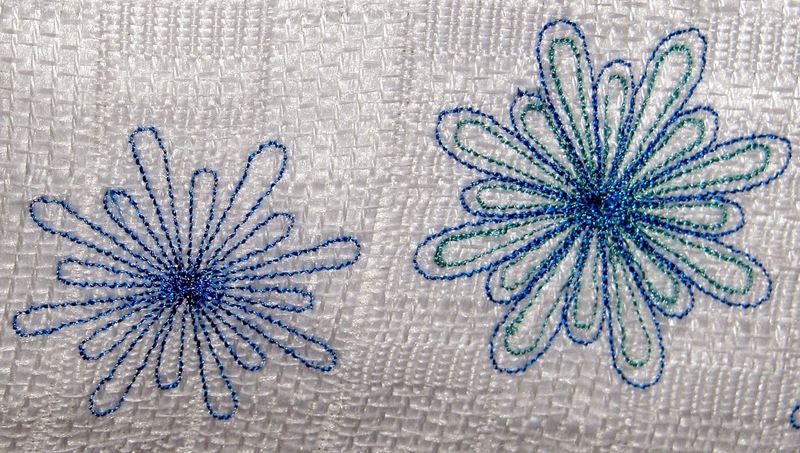 If you watch a machine embroidery design as it sews, you can get ideas of ways to use parts of it. This design starts with the outer star outline and progresses inward. Most embroidery machines will allow you to skip a section. Or you can skip the beginning and use the inner part. For the white pillow I set one 5" star and seven of the 3.75" stars. First I sewed out the first two colors in the large center star. Then I skipped the two center sections. Then I proceeded to skip the two outer sections of the smaller star which was also in the center. (It was right on top of the large star on my design screen!) 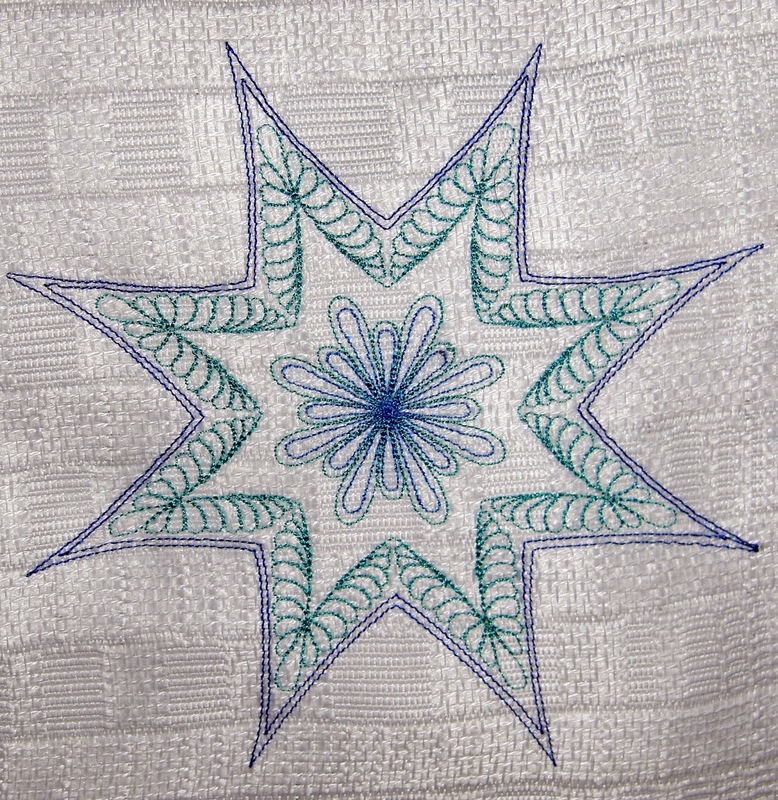 I sewed out only the inner sections right in the middle of the large star. This put the smaller center inside the larger star outline and feather design, leaving some white space and actually making a new design. In the same manner for the other six smaller designs, I skipped the outer two sections and on four of them only sewed one section. As you can see, the middle design on each end of the pillow has two sets of "loops" while the two on each side of it have only one. I love being able to use parts of a design like this. I want to do a trapunto design sewing only the two outer parts of the design so that the center, unembroidered, star shape will really puff out. I am certainly not done experimenting with this design. Another little project that I did unfortunately did not photograph well. 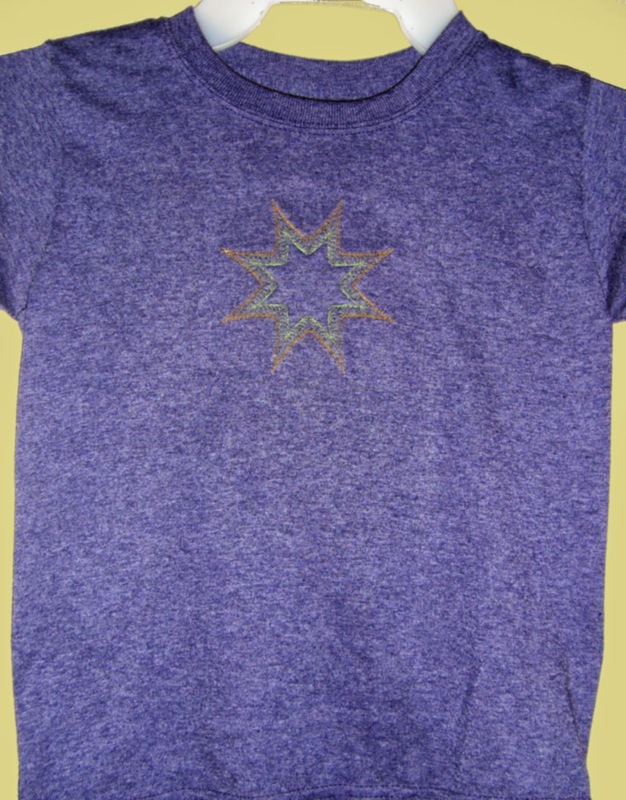 It is a T-shirt for a child that I did the outer star on the front. Because the T-shirt is a "tweedy" weave, it confuses the camera imaging receptors. But I am going to show it anyway. Notice that I stopped the design with just the two outer sections this time. So that makes four different designs that I have managed to get from this one design. As you can see the heathered shirt somewhat hides the design in a photo..but in person it is quite attractive. I also used a layer of cotton batting behind this so the center has a slight trapunto effect. I also used cutaway stabilizer so that the batting is contained and won't fray. Let me encourage you to stretch your imagination. 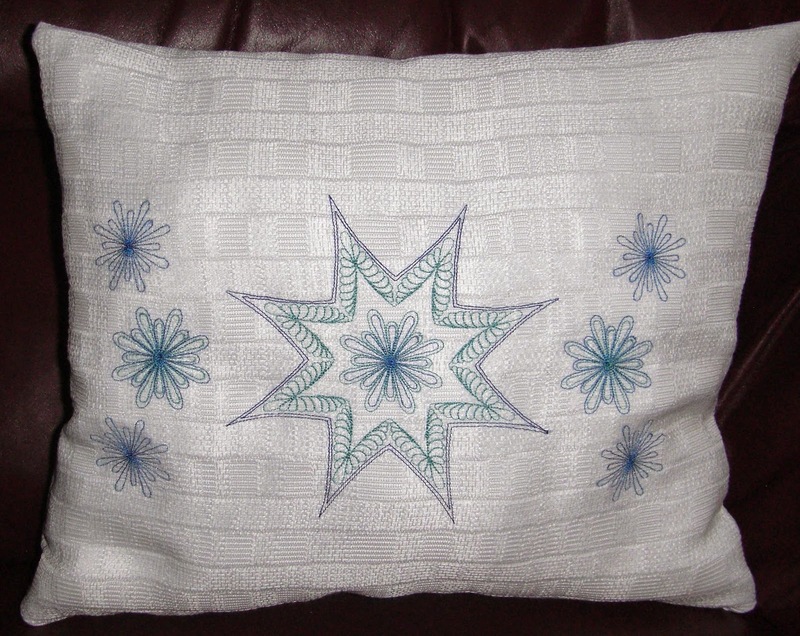 You may be able to do more with your embroidery machine than you ever imagined. Of course, well digitized designs, like these from Patsy Thompson, make experimenting so much more fun. I think this design would be great done on a red sweatshirt in green and/or white threads for holiday wear during the Christmas Season. The white and blue make me think of the holidays also. But I suspect my great nieces who love the movie "Frozen" will see snowflakes and grab it for themselves. Some of you may have read the post on my blog yesterday where I showed a "sneak peek" at some test blocks that I used to practice free-motion quilting. Here are the pictures of those blocks which will show you how these designs can look in a quilted setting. Now for that giveaway I mentioned in the title: Patsy Thompson will give one of my readers your choice of any downloadable digitized pattern or design on her web site. This is an excellent prize. To be truthful, this would be a very difficult choice for me. But to register yourself in this giveaway, leave a comment with your choice of design. Be sure that if you are a no-reply blogger that you leave your email address in the comment. I must be able to contact you for you to win. Otherwise I will choose another winner. This will remain open until November 14th at midnight Central Time. I will announce the winner on the following day. And just for fun, I would like to know what type of project you would plan to do with the design you choose. I will choose the winner randomly from all eligible commenters. Here is a list so you can see the entire blog hop. If you missed Kelly's post yesterday, be sure that you go back and read it. Then also be sure to check the other entries as the week progresses. 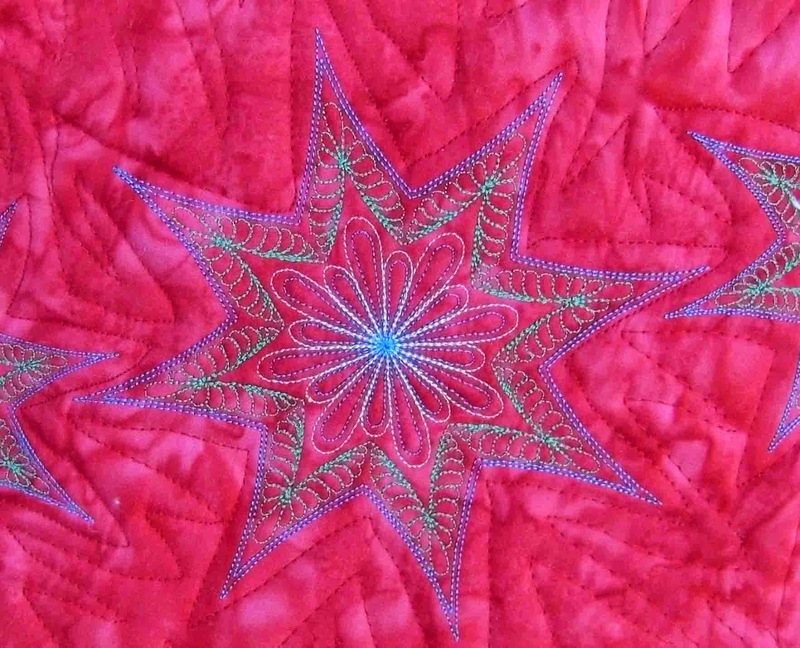 Gene, I love what you did with this feathered star--and I love that it comes in three sizes. What a great way to use it. Beautiful. I love Patsy's designs. If I win, I would choose the feathered wreath quilt block designs to make a quilt. These are lovely, Gene. I would use the stars on table linens for the holidays if I had that capability. I need to explore what my old Janome can do! I would choose the feathered start to play with. Loved this blog. I have done very little of this machine embroidery. I have a module for my Bernina machine but I have not done much with it. Your pictures and projects were very inspiring!! Thank you, Gene! 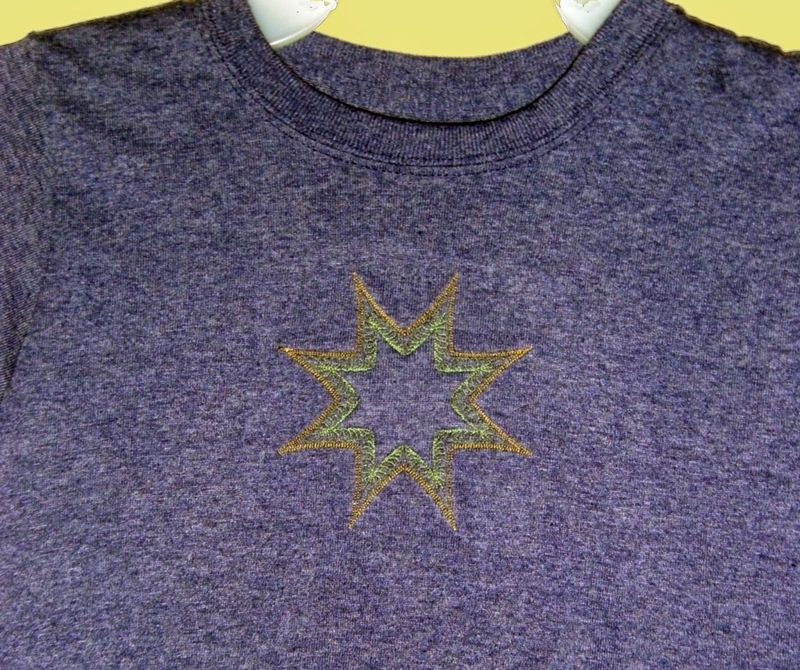 Gene, I love the t-shirt and think you should try slipping some of your weaving behind the star before embroidering for a reverse applique woven star. So... guess you know what I would do with one of these designs. I would choose either this same star (thanks for showing so many possibilities!) or one of the gorgeous hearts! Super job with your pieces! I love that you went outside the box/block design and experimented. I think that white pillow is beautiful just as it is. I don't have the machine for these designs but love what you did. I love your projects!! The designs are beautiful! I learned something as well. I learned about using parts of a design. I thought you should be able to, but wasn't sure how to do it. Thanks for the giveaway!!! I would love either one of the feathered wreath designs if I were to win. Beautiful pillows! I really like your ideas of using just part of the designs. I like Patsy's Tic Tac Tulip design. I think I would apply the same type of concept...using the parts in a quilt, but not necessarily making the entire quilt layout as shown in the pattern. Very creative Gene. Love your pillows. I like the way you think about only using the parts of the design that you want. There are several great patterns that I would love to have! Put the feather wreath I can see me doing more with! If I win this design I would love to make a quilt! So many "favorites" -- it's difficult to choose, but my heart is closest to Majestic Feathered Wreaths. I'd LOVE to do an entire quilt with these designs. Thanks for the great blog post and giveaway! Gene your pillows and shirt are wonderful!!!! I love your creativity with Patsy's design....very inspiring. Your quilting looks great too. I think we are are more critical of ourselves than others are of our work. Yours looks great to me. Nice job with your projects! Thanks for sharing. I like Patsy's Tick Tack Tulip quilt pattern the best. 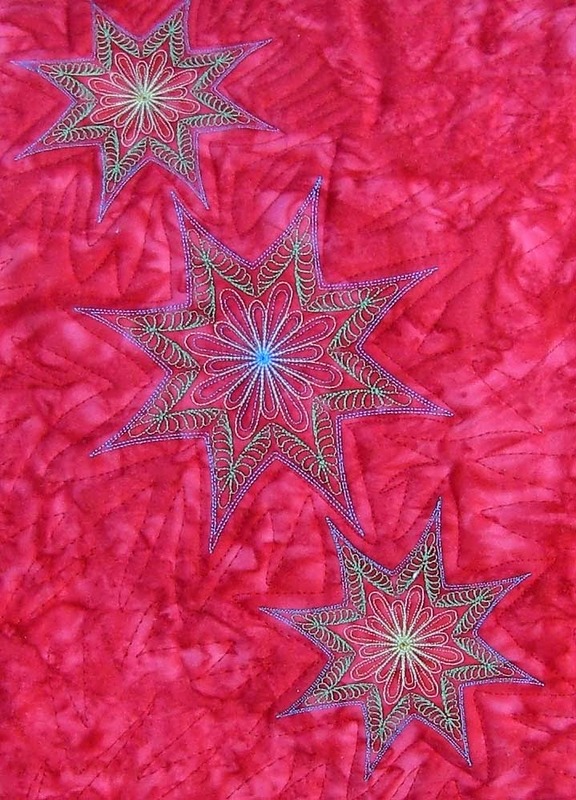 Very versatile and beautiful star designs. I should have the machine that does this for my mini quilt group swap. Stars was the November theme. Hard to pick a favorite, all are unique! I love taking designs apart and seeing what I end up with, sometimes it's good sometimes not so good. Love your pillow. I really enjoyed your different projects with the designs. I love all the designs hard to pick just one. I did enjoy diamond back spine wreath. Thanks so much. Lots of lovely designs to choose from! I really like your star that you used, but my favorite is B2 Pearls and Figure 8's Wreath. I've been making tote bags for friends for gifts and I can see this design on the front next to their monogram. I will wait to finish my next one in case I win! I would love to use the tulip quartet block. It would make a great wall hanging. Love love love the feathered star design. I really want to make a wall hanging with it. Thanks for all the great ideas! I like that you created other designs with the feathered star. Patsy has many lovely designs, It would be hard to choose; but I would love to try! Good ideas. You have inspired me to take out my embroidery designs and play. I am a big fan of Patsy's feathers starting with her quilting DVDs. Beautiful ways to use designs and personal creative ideas. Would love to try her designs! Great ideas on splitting up designs to get more bang for your buck. I really like Patsy's Harmonic Songbirds. Thanks, I would probably pick one of the hearts. I like to change out small quilts for the holidays and I could make anything from a mini up to tv lap quilt with hearts. Beautiful. I love Patsy's wreath designs. Thanks so much for sharing, Gene. Thank you so much for a truly interesting post. I love the look of Patsy's designs and your perspective of the designs is excellent. I am always taking apart a design so I can use just a portion of it and it's great to see that someone else does the same. 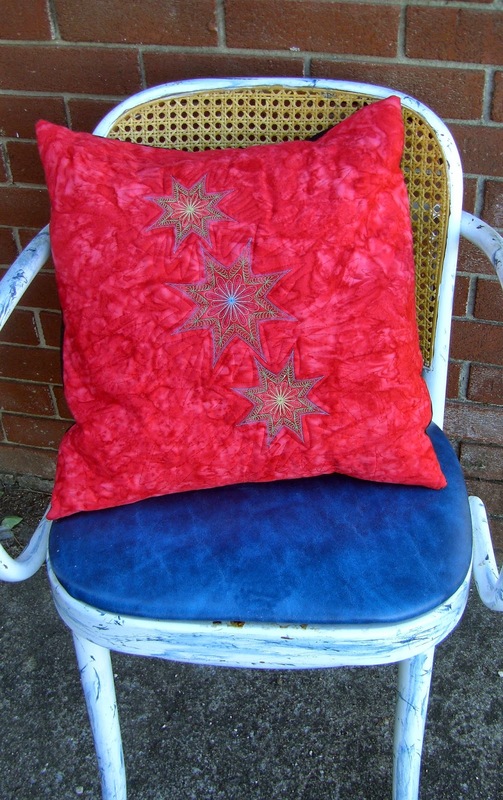 This feathered star is spectacular - ooooh, I can see it in metallic threads, too! I so love that you "took apart" the design and played with the components to generate more Offshoot designs. Wonderful tutorial about how to do that! Love the T-shirts and the FMQ around the other Stars you did. I would love to win one of her designs, they are just beautiful. I'd make a pillow like you did! Thanks!!! The stars look great. I like to put batting behind my designs for the trapunto look too. I'd love to stitch out those feathered wreaths. The stars are beautiful as is, but I like how you creatively used parts of the design. I like Patsy's Corner Setting Triangle Feathers Pair design. Patsy's designs are amazing. I love the Posies on Point!